With heavy rains you may have some strange visitors show up on your sidewalks and driveways. 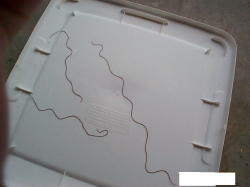 These long string like worms are horsehair worms. See the photo below and click on the link to learn more. Horsehair worms are also called Gordian worms because they will often twist into a loose, ball-shaped knot. They occur in knotted masses or as single worms in water sources such as ponds, rain puddles, swimming pools, animal drinking troughs, and even domestic water supplies. Adults measure 1/25 inch in diameter and may reach 1 foot or more in length. A common misconception is that these long, thin, brown to blackish worms develop from horsehairs that fall into the water. They are parasites of invertebrates, especially certain insects and commonly found in agricultural areas having water-impoundment and irrigation facilities. Horsehair worms are harmless to vertebrates because they cannot parasitize people, livestock, pets or birds. They also do not infect plants. If humans ingest the worms, they may encounter some mild discomfort of the intestinal tract but infection never occurs.